I want to introduce you to my friend Lori Haynes and her ingenious business, Dripping Springs OLLAS. Long before I actually met Lori, I had heard of her reputation ... she was creative, imaginative and artistic; gifted in coming up with ways to solve problems. I can tell you that it is all true, and she has turned her talents into creating a modest little business selling an ancient technique for irrigating plants. Lori happens to live in a part of Texas that is rocky with poor soil conditions. Trying to successfully grow a vegetable or flower garden in nearly constant drought conditions was something that tested her inventive talents. But she did a lot of research and discovered that "buried clay pot irrigation" was a time-tested technique that just might work for her circumstances, as well as others who wanted and needed an effective irrigation system. She configured the exact size and shape that worked best for her and the results were phenomenal -- she successfully grew tomatoes, other vegetables, and flowering plants in the summer of 2011 during one of the most extreme droughts Texas has experienced. Now PLW and I are shameless advocates of her OLLAS, which is an unglazed clay pot that is fired at a low temperature, allowing the pot to be porous. When the pot is buried up to its neck in soil and then filled with water, the porosity of the pot allows the water to seep out, thereby supplying a constant source of water to the roots of your plants. There are so many benefits to this type of plant irrigation. First of all, it is low tech, requiring no electricity; plus it is a low cost alternative to more expensive methods of irrigation. This method does not need your constant attention; you just fill up the clay pot every few days, depending on your location and soil disposition. No more drip systems, high water bills, or worrying about over or under-watering your plants. I can tell you that PLW is impressed with how well his nascent grape vines are flourishing, as well as the new peach trees he planted. 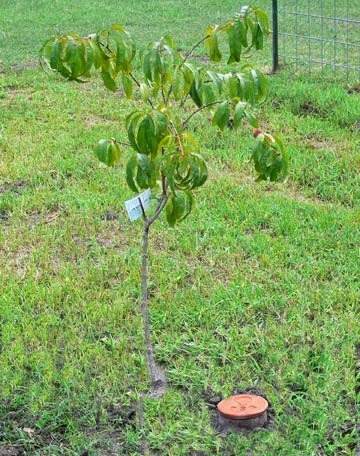 The searing South Texas heat had just about discouraged him from trying to successfully nurture any fruit trees or plants. He couldn't pour enough water on them to keep them from wilting and succumbing to the scorching sun! But now they seem ambivalent to the intense heat and are growing at a faster pace than he imagined they ever could. He's especially thrilled that since there is no surface water, the weeds are kept at bay, too. He's now so impressed with this simple method of irrigation, he's planning our next garden based on how he's going to use the OLLAS. I'm sure by now, that you have realized this simple and unique irrigation system is perfect if you're a prepper. No worrying about the grid going down ... if you have rain barrels or a hand-pump, you will be able to keep your OLLAS filled; you couldn't ask for a more efficient or easy method to make sure you can grow a healthy and productive garden during hard times. But why wait until TEOTWAWKI comes knocking at your door? Buy your OLLA today ... prices aren't getting any cheaper at the grocery store and I promise you that you will be amazed at the yield your garden produces! Isaiah 44:3 "For I will pour water on the thirsty land, and streams on the dry ground; I will pour my Spirit upon your offspring, and my blessing on your descendants." I am installing a small garden in my backyard. Sadly, I work long hours throughout the day, so I can't give my garden constant care it needs. Would it be a simple process to set up an irrigation system in my garden? It would be nice not to buy a whole watering system.